Tales from the Trail Tales from the Trail: raptors! Tales from the Trail: raptors! A special treat: these days, the sun rises at 6:50 in Portland, and earlier every day. Which means that on a day where the clouds aren’t too low and dreary, by the time I get to the Springwater trail, about 25 minutes into my commute at 6:30ish, it’s already starting to be light out. By the time I get to Gresham, around 7:05, it’s officially daylight; by the time I get to work in Gresham it actually feels like the world has come to life. And what that really means is that I’m into the season where I get to see — actually see, and be awake with, rather than biking through before — all the birds along this lovely little path of mine. 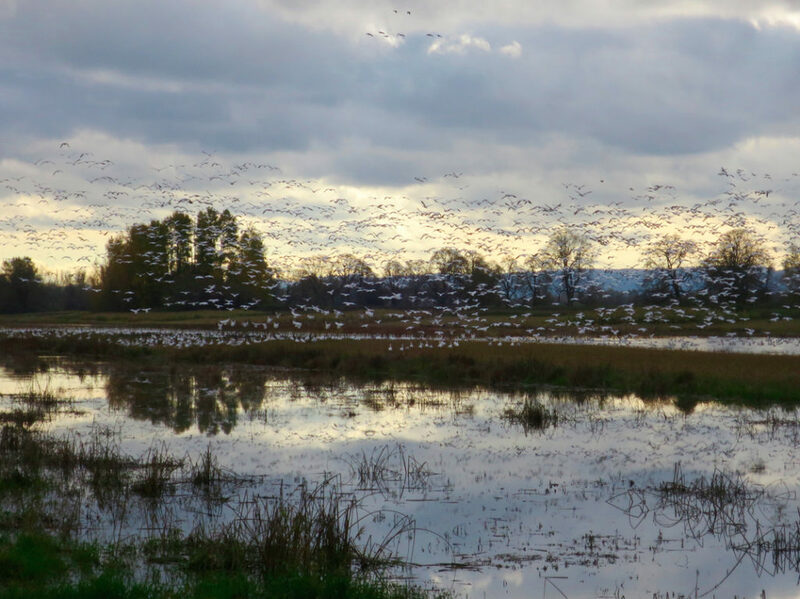 And even better, the coming of the light and the warmth means that the bird population is also starting its seasonal explosion: all our little migrators come back to stay for a while or pass through on their way further north, doubling or tripling the number of birds around. Some of the sweet little birds that I newly get to see with all this daylight are also raging carnivores. Not too far from Main City Park, where I finally get off the Springwater for my last jaunt through Gresham’s suburban streets, I’ve been watching a Cooper’s hawk. 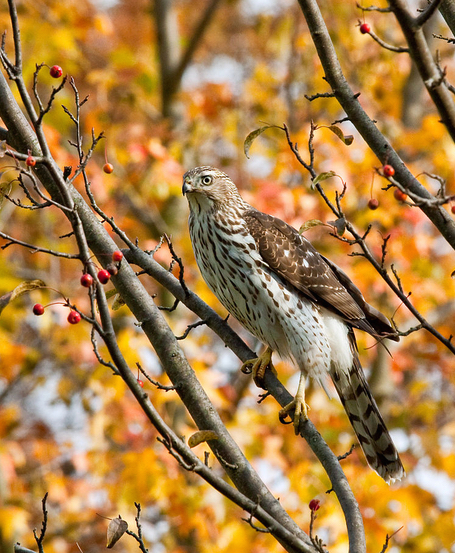 Cooper’s hawks aren’t migratory, at least not in these parts; they stick around all year. But the advent of daylight has meant that in the last few weeks, I’ve actually been able to see one particular hawk that haunts this part of the path along Johnson Creek. 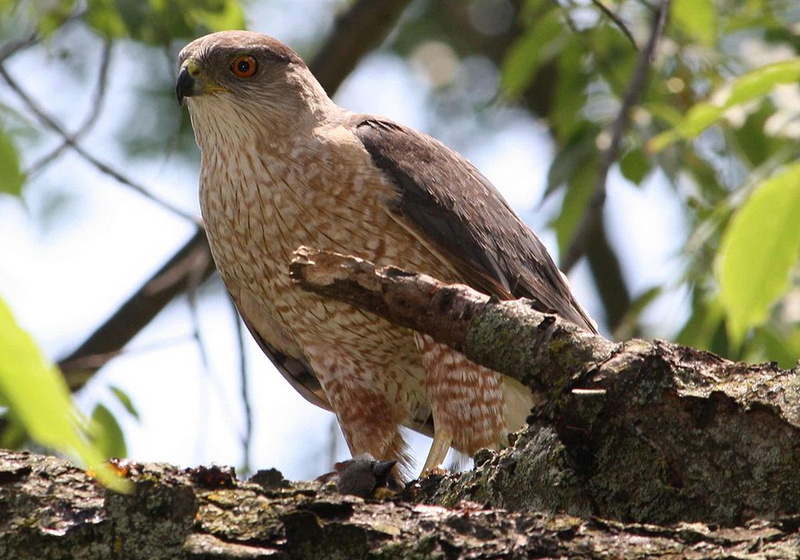 Do you know Cooper’s hawks? They’re fairly easily overlooked, since they fly swiftly and stealthily, over you and gone before you know it. They’ve got the classic hawk-y look, with a long, slightly rounded, black-striped tail and a fairly obnoxious call (listen here for an example). If you can see them closely enough, with binoculars I mean, they’ve also got a beady red eye, which seems fitting for their being the scourge of other, smaller birds everywhere. Cooper’s hawks? They zoom through the trees, grab other birds mid-flight, and then squeeze them with their talons until they die and provide a tasty and proteinaceous meal. Grabbing birds mid-flight is no easy task; an article I read somewhere mentioned that of a study of some 300 Cooper’s hawks, about 25% had broken bones in their chests from running into things during their crazy twisty flights. Other birds, of course, have a healthy fear of Cooper’s hawks. Even though they’re not themselves too much larger than a crow, Cooper’s hawks routinely take down birds like pigeons and robins. They’ll even take on sharp-shinned hawks, their slightly smaller though no less carnivorous cousins. Which means that some birds, like juncos, have evolved warning calls specially formulated to let others of their species know that a ravenous Cooper’s is in the area. Sometimes when I bike through, I hear these calls and I know the hawk is near even if I can’t actually see her (or him). Or other times, the entire path is silent, eerily so, and I suspect the hawk has recently flown by, that all the little birds are doing the equivalent of ducking for cover and tucking in where sir or madam Cooper’s hawk won’t notice them. Last week, I saw a crazy drama unfold between the Cooper’s hawk and a red-tailed hawk that was sort of like watching crows divebomb bald eagles: the red-tailed hawk is so much bigger, and yet the Cooper’s hawk was mobbing its perch with impunity: get the heck away from my spot! I highly suspect this Cooper’s hawk has a nest somewhere in the vicinity that it’s protecting, but so far I haven’t been able to find it. Anyway. It’s a lovely little perk to my ride these days, the in-the-daylight morning and evening look for the Cooper’s hawk and its elusive nest. It’s one of the nice things about consistency, even though I often rail against routine: I do like being able to watch this natural drama unfold, I like going past the same spot to check on the progress. One of these days, I’ll find the nest. Cooper’s hawks are neat. You wrote an excellent article, for certain! We live here on Cooper Street in Accord. I have often wondered if it got its name from the hawk. Some day I will take the time to find out. At any rate, we have a bird bath in our back yard that two immature Cooper’s hawks used on several occasions two years ago. It was early summer and the two birds simultaneously settled in to dabble in the water. They splashed around for several minutes each time, groomed each other, and flew off. There were song birds all around them and surprisingly the Hawks never bothered the smaller birds. It was absolutely amazing. Unfortunately I never got a good picture of the two of them, but I did get a picture of one in the bath alone. Since then we have seen Cooper’s hawks on various occasions. Usually we see them flying low and fast through tree branches as they seize a blue Jay or a dove for their meal. It is a thrill to see them, but it is also a bit sad that we have created a feeding station for Cooper’s hawks. There is some solace, I guess, knowing that there are far more jays and doves than there are hawks. Once upon a time when I was with my crew at work, we saw a Cooper’s hawk speed past with a crow in its talons, with maybe 5 other crows furiously in pursuit — as you say, a thrill indeed. Everyone’s gotta eat, right? ;) Thanks for sharing your bird stories!